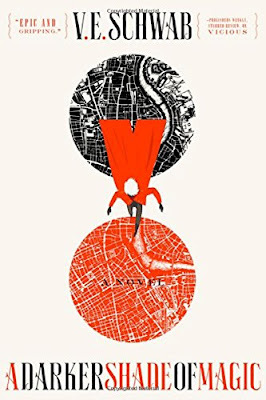 Kell is one of the last Antari, someone with an extremely rare sort of magic that allows him to visit the parallel universes of London. As a personal ambassador and royal messenger to the King and Queen of Red London, Kell often visits Grey London and White London to pass royal communication. Grey London with its lack of magic is a far safer place to travel than White London, where the people thrive on murder and the magic fights those who try to possess it. And then there was Black London. A place that has fallen into fable, were the magic was supposedly a sickness. Black and deadly. But being a royal postman often lacks adventure, and so Kell takes his amusement by smuggling pieces of other Londons for those interested in the worlds beyond to see. And it’s the smuggling that set Kell up for treason. And just when Kell figures out that something is amiss, he is blindsided by Delilah Bard, a thief who isn’t afraid to choose wrong over right if it means she keeps her life. The only problem is that tangling with Kell and the dangerous magical war on the horizon means that wrong or right, her life might just be forfeit. I have seen this book around plenty, but now that I have read it, I feel like more people should be talking about it because it is awesome. I loved this world (these worlds?) and how they worked. The world building in this one is fun and intriguing. I loved Kell and how he was excellent in his magic, but also vulnerable. I hate characters that are too good at everything, and Kell was just the right balance. I had a love hate relationship with Delilah, who was exasperating in the best ways and pushed the story along. I loved how unforgiving this storyline was too. This type of fantasy is right up my alley and my preferred reading, and so I loved falling into the comfortable patterns of magic. I often fall into expectations with these stories, with the cliches and patterns out there that we love and hate at the same time. But Schwab surprised me enough times, and her choices in the story, who lives and who dies, made me think she might be somewhat of a pirate. For awhile I thought that this would just be laying the foundation for the series and fleshing out the players, rather than one complete story within a whole. But the last 100 pages brought it around. It felt a little bit hurried in places, but I’m not complaining. With the way this story ended and some of the small hints along the way, I'm very curious as to how the rest of this trilogy will play out. I’m VERY much looking forward to the Feb 23 release of the second book and to go with these characters on the next level of their journey. This is one that is going straight to the top of my recommendation list.